Part 1: Create a killer mix of media that will leverage maximum sales and profits. When it comes to media, following the leader is a certain road to mediocrity. Some media are grossly overrated by the “experts.” Other media that could help you may be underrated or discarded altogether. If you track this series of articles, I will show you how to use your ad dollars to create a media mix that works to increase traffic and cash flow. First of all, understand that a medium delivers a message. That’s all it does. There are no “good” media and “bad” media. There are situation-appropriate media, and media that are situation-inappropriate. When someone suggests the latest social media fad will solve all your media problems, don’t believe them. When someone tells you that all you need is radio, or that ROP newspaper doesn’t work,” or direct mail never works, run, don’t walk for the exit. For maximum results in your market, there are only strong, effective, evidence-based messages delivered in a timely, appropriate way. These messages may be delivered by a single medium, or a combination of several media. This does not only apply to independent home furnishings stores; it also applies to franchise stores that have some control over their media mix. Why is this important? Because, a prospective customer will want to deal with you only to the extent that they see a unique advantage in it for themselves. The better you are at answering the WIIFM? question (compared to your competition), the more market share and business you will get. If you and your competitors are equally weak in your presentations, then the playing field is leveled. If you are brilliant in articulating your USP regardless of the medium, however, you will leave competition fumbling in the dust. In a print ad, the power begins with the headline. A well-fashioned, benefit-rich headline can out-perform a weak headline by a factor of ten or more. If you can legitimately SAY something your competitor cannot say, and you neglect to do it, your competitor will rejoice. Moreover, if you can SHOW something that your competitor cannot show, and you fail to do it, your competitor will rejoice even more. But if you learn to leverage with the “Fusion Factor” you will make your competition irrelevant. The Fusion Factor is one of those powerful principles of effective, evidence-based advertising that has been generally lost on “modern” ad people. Yet, when I explain it you will see that it is so self-evident that it is astonishing that very few ad people are aware of it. Home furnishings preprints and flyers are almost exclusively price-item presentations. The problem with price-item offers has always been the same. If a lady is shopping for a living room group and she sees a hot price and a beautiful full color illustration in a flyer, but she doesn’t like the design, you have lost her. So the big boxes attempt to flood the market with as many different designs and offers as they can. In most cases they use label headlines and weak copy. They may brag about a huge selection, but all they illustrate is vignettes of groups, or single items. The little store down the street can rejoice because he or she can also show manufacturer illustrations and do price-item offers in his ads just as effectively. The big box could show dramatic concept shots of their showrooms, but they do not. There are too many different showrooms involved and the copycat strategy of inundating the market with price item offers seems to work. And herein lies a huge opportunity for the smart independent. What do women want? Selection for sure. So a headline that states: “30,000 square feet of famous brand bargains” that is illustrated with a dramatic showroom shot can be unique and very effective. There is an instant fusion between the headline and the illustration. Big box preprints and flyers are prepared in great haste by technicians who are good at what they do but who have no concept of evidence-based, effective print presentations. With all the talk about “branding,” very little concept is presented in big box flyers. So take home this principle: Show things and say things your competitors cannot in every medium you use. It may be true that TV is potentially most effective and dramatic in establishing a brand, but it is also cost-prohibitive to dominate the fragmented TV market. All media should reflect your brand, not just TV. Walt Disney originally established the Disneyworld brand almost totally by means of People Media, the most powerful, most underrated, and least understood advertising force ever discovered. More on this in later articles. Newspaper Preprints. This has been the favorite medium for home furnishings for some time, and for good reason. A full color preprint brings furniture to vivid life. Unlike TV, the prospect can linger over the offers. The reproduction is much better than ROP newspaper advertising. The downside for independents is the cost, and the growing clutter (especially on specific days) in many markets. Unfortunately, most independents who are able to produce their own preprints tend to copy the big boxes. They use label headlines, price-item offers, neglect articulating benefits, and fail to brand with personal messages, creative graphics, illustrations, and USP factors that their competitors cannot answer. Social media is fine, but why confine it to the internet? Why so few personal messages and fascinating home furnishings stories in preprints? It seems as though the ad departments and merchandisers believe that all women care about is price, price, price! These failures to leverage the power of preprints are also in evidence in ROP advertising. Newspaper ROP Advertising. I am going to use the rest of this article to address newspaper advertising because it often gets a bad rap. One of the myths I have heard is that “no one reads the newspaper anymore.” It is true that the readership of newspapers has drastically declined, especially among the young. However, a large segment of the older population still reads the paper. And, it should be noted that the over 40 group controls most of the buying power. They are also most likely to buy better home furnishings. ROP newspaper ads are also very effective in augmenting preprints. A preprint insertion begins to run out of gas after a week or so, and it is a proven fact that well-crafted “final days” ROP ads will turbo-charge final results. Some savvy big box entrepreneurs do use ROP in this manner, independent of their corporate programs. Their ROP efforts also use strategies that augment their hometown status and appeal. There is also another very important value in ROP Newspaper. Immediacy. ROP newspaper can do something that no other mass media can achieve as cost-effectively: It can turn on a dime. The only exception is radio. In fact, a combination of radio and ROP can convert a catastrophe into a victory. Many entrepreneurs are feeling lost these days. It is tough out there. Being lost in a situation such as Gina’s (or in a deep recession) is almost like being lost in the wilderness. Unfortunately, most people who get lost in the wilderness give in to fear. They fail to do the one thing that could save them. They fail to think. They are frozen in the headlights. There is an old adage by the famous psychiatrist, Alfred Adler: “Trust only movement.” Gina thought things through and she began to move. First she got authorization from the local owner of the franchise store to take action. Next, Gina ordered a full page newspaper ad for the weekend, just a few days away. (See exhibit on page 38). Then, in a flurry of activity, she took digital photographs of the situation in her store. She bought radio time. By the time the weekend arrived, thanks to the internet, she had a powerful newspaper ad in the paper, strong radio commercials, special sale tags, signs for her windows and a barebones strategy for the next eight weeks. 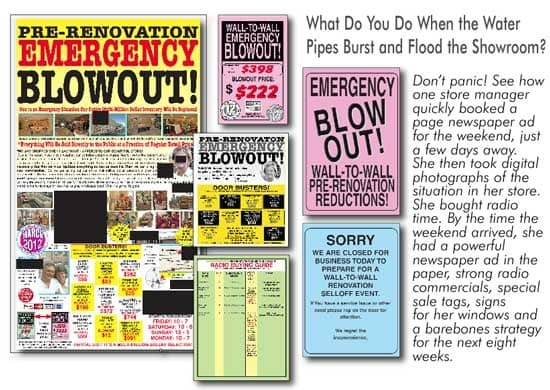 There followed three full weeks of “Pre-Renovation Emergency Blowout,” and then a “Renovation and Ultimate Selloff.” Gina did two months of remarkable record-breaking business while she got her store ready for a Grand Re-Opening Sale and the resumption of regular business. I know of no other media that could have gotten Gina’s story out to the public as quickly and as cost-effectively as ROP newspaper and radio. The corporate management of this particular big box chain is wise enough to allow franchise stores the latitude to outsource advertising creation when time frames make it necessary. This leads to another weather-related story that took place a couple of weeks later, and a thousand miles away. This event took place in a rural area of Minnesota. Presidents’ Weekend Snowed Out In Minnesota! It is virtually unheard of for Minnesotans to be stopped cold (literally) by the weather. But it happened last February. Coincidentally, this story is about another big box store, one belonging to a different chain. On Presidents’ Weekend, record snowfall and high winds impacted the state. The Minnesota Department of Transportation recommended no travel for the southern half of the state due to high winds and heavy snow. 700 flights were canceled. 323 automobile crashes were reported statewide from 9 a.m. to 10 p.m. High winds and freezing mix made some areas impassable. Of course, the big sales volume the y hoped for on Presidents’ weekend never happened. What to do? The local owner of a top-producing big box franchise in a rural area of southern Minnesota acted quickly. 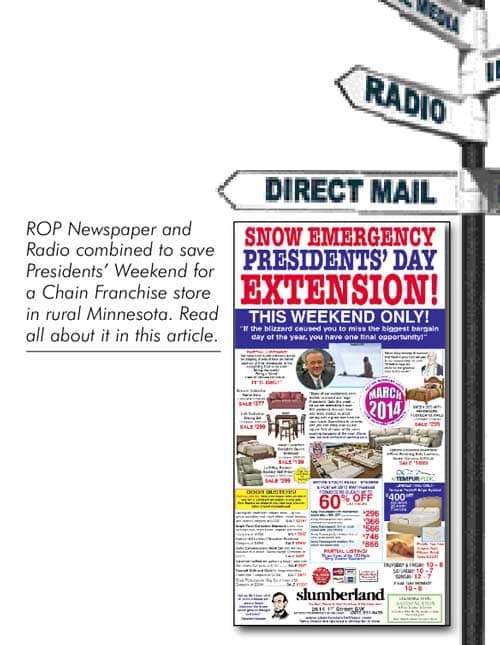 By the next weekend (thanks to the internet and FedEx) a “Snow Emergency Presidents’ Day Extension” ad was created in the newspaper, plus supporting radio, point of purchase tags, signs etc. (See exhibit.) This brilliantly managed franchise store regularly uses newspaper and radio on a local level to augment the corporate efforts of the chain. In a rural market area of less than 20,000 people, the franchise regularly produces $400,000 or more a month in profitable business. 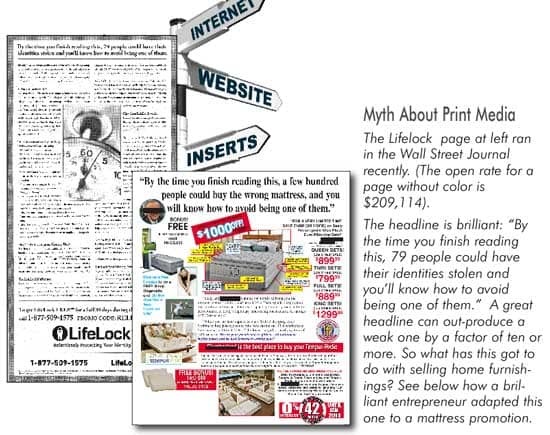 Aside from the immediacy factor and the proven ability to leverage the longevity and local appeal of a preprint, there is yet another compelling reason that newspaper ROP should be part of your advertising mix, whether you are a franchise or an independent home furnishings store. Preprinted corporate flyers lack warmth, personality, and the ability to connect on a local level. A local newspaper can use illustrations of the hometown store and its personnel, and offer limited stock “door-buster” items to augment corporate merchandising. Too often, there is an enormous amount of local store innovation and creativity that is stifled by restrictive corporate policies. A common complaint I hear from franchise stores is this: “Unless the idea originates in corporate, they quickly discard it.” Control is important, but there is an alternative to crushing local initiatives and innovations. This HF training center would conduct regular classes for other franchise locations. That big box would vault ahead and be very hard to catch. This is the technique of leaders training leaders that is used by the military. And this is why the late Peter Drucker, the father of modern management, declared that the U.S. military was the best in the world at training leaders. Not the Harvard Business School, or IBM, or Proctor and Gamble. The U.S. Military. In Part Two of this series, we will examine Direct Mail, Radio, Television, Websites and the Internet. Then we will show how to create a killer mix of media that will leverage maximum sales and profits. Larry Mullins is a contributing editor for Furniture World and has 30+ years experience on the front lines of furniture marketing. Larry’s mainstream executive experience, his creative work with promotion specialists, and mastery of advertising principles have established him as one of the foremost experts in furniture marketing. His turnkey High-Impact programs produce legendary results for everything from cash raising events to profitable exit strategies. His newest books are, “The Metavalues Breakthrough” and “Immature People With Power… How to Handle Them”, have recently been released by Morgan James Publishing. Joe Girard, “The World’s Greatest Salesman” said of this book: “If I had read Larry Mullins’ book when I started out, I would have reached the top much sooner than I did.” Larry is founder and CEO of UltraSales, Inc. and can be reached directly at 904.794.9212. See more articles by Larry at www.furninfo.com or www.ultrasales.com.